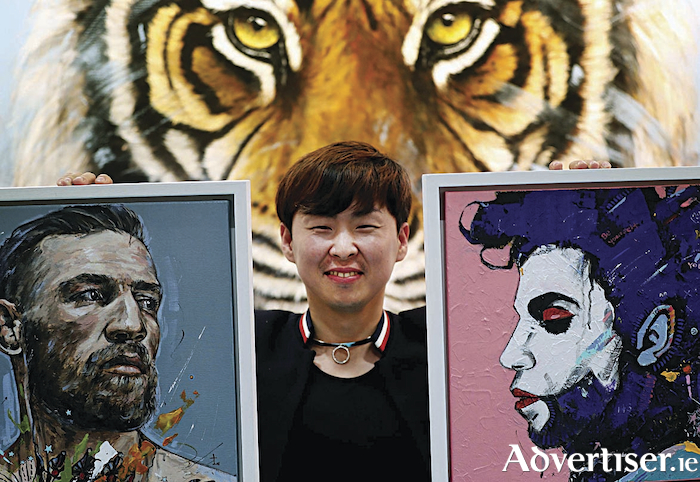 A Galway-based artist, who was recently honoured by the Irish Chinese community, will exhibit colourful new work at Ireland’s premier art fair Art Source, which will be held at the RDS from November 9-11. Despite getting caught in a devastating hurricane, while on holidays in Japan last month, Jin Yong has made it back unscathed to Ireland to complete a brand new collection based on endangered species. “It was the worst hurricane to hit the country in 25 years and was very scary. There were gates and everything being blown away and buildings were actually moving with the force of the wind,” he said. Luckily, he was uninjured and made it back to finish his new collection, which is based on endangered animals like sea turtles and gorillas. He was also the first artist to be awarded with the Chinese Professional Achievement accolade in recent months. The award is given by the Chinese community in Ireland, and honours Chinese people living here, who are promoting links between their native culture and the Irish heritage. “It’s the first time ever an artist has been chosen for the award, as it has been traditionally given to those from a medical or academic career so I am very proud and honoured that I was nominated for raising awareness of Chinese culture through my work,” he said. Over 15,000 people are expected to view exhibits from artists across all genres at the biggest art event of the year which features over 175 contemporary artists and galleries over two floors showcasing painting, sculpture, photography, illustration, prints and ceramic art. From cutting edge contemporary art, realism and portraiture, to abstract art and landscapes, Art Source 2018 will showcase it all in one place and give visitors a fantastic opportunity to meet the artists and to buy directly from them for three exciting days in November. And there is an opportunity for visitors to the show to own a piece of original artwork in Art Source’s unique 100 for €100 project, with pieces available on a first-come first-served basis. Among the artists featured at Art Source is Pop Art sensation Cavanagh Foyle, an aviation lawyer who is fast gaining an international following for her provocative and colourful mixed media paintings. Gormley’s Fine Art will be featuring a rare iconic collection of Ingrid Bergman prints by Andy Warhol as part of a US Pop Art exhibition at the show, which also features Roy Lichtenstein, Tom Wesselmann, Robert Indiana and Jean Michelle Basquait. Art Source takes place at the RDS, Dublin, from November 9-11, admission is €10 adults, €8 OAPs. Children under 16 free only if accompanied by a parent or guardian.